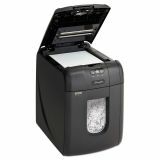 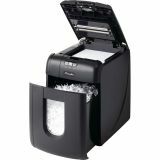 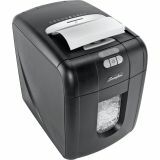 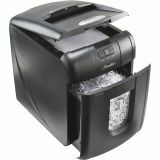 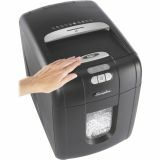 GBC Stack-and-Shred 130X Auto Feed Super Cross-Cut Shredder, 130 Sheet Capacity - From Swingline, the company that you've learned to depend on to supply your office needs, comes the Swingline Stack-and-Shred Paper Shredder. 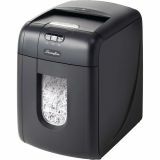 No longer are you chained to the side of a shredder, feeding document after document through. 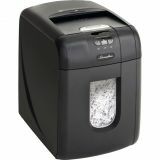 This new Swingline features a four-digit programmable PIN code lock that allows you to stack the items marked for shredding and simply walk away. 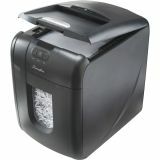 Remember all that time spent clearing jammed documents from your shredder? 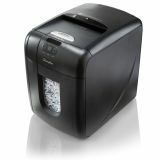 Jams are a thing of the past due to the VisiJam Protection built into this new Swingline. 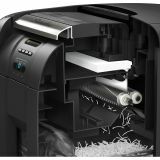 This new automatic jam clearance feature insures that up to 8 sheets will feed through the wide 9" throat without a jam to slow you down. 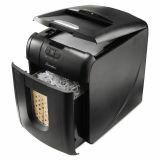 And if you're concerned about security, worry no more. 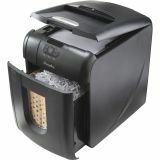 This Swingline provides Level 3 security protection, cross-cutting as it shreds, making confetti of private documents. One letter-sized sheet of paper is diced into 377 tiny pieces. 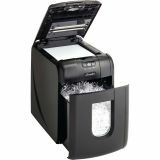 Simply wait until the shredder is done and pull out the 11-gallon wastebasket to discard of the miniscule pieces of now-secure trash. 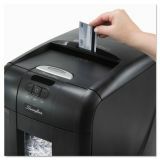 The Swingline Stack-and-Shred Paper Shredder is tough enough to slice through staples and paper clips, durable enough to cut through CDs and credit cards. 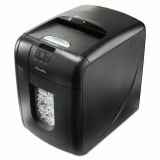 Whether you're looking for a shredder for your home or small business, this Swingline is designed to perform. 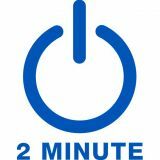 Go on about your other business as it quietly shreds uninterrupted for 30 minutes at a time. 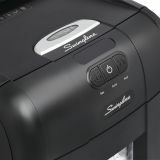 Finally, because Swingline cares about your bottom line, this shredder offers an energy-saving power mode. 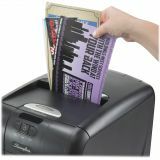 Now you can look out for the environment while protecting your assets. 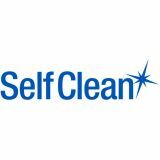 Intelligent Self-Cleaning Cutters™ automatically remove shreds that cause build-up and lead to jams. 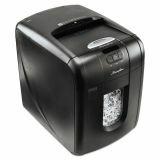 Intelligent Power Save™ auto shut down with automatic wake-up conserves energy. 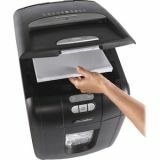 12" x 18" x 17"